I’ve talked about it a lot on here: mindfulness. About how you bring into your life whatever you spend your energy thinking about. It the whole concept touted by “The Secret,” “Instructions for happiness and success,” and thousands of other self-help titles and teachings. And I believe it – truly I do! But sometimes it’s hard to maintain that positive attitude. Especially when you’re stumbling over challenges, fears, and what feels to be a million other forces that are working against you. So what do you do? Guys, you’ve been through a lot with me. You’ve been there for my trials and my celebrations. Most recently, you’ve been with me as I found a wonderful man and got engaged, you’ve heard the great news about us finding a new home to call ours, and you’ve watched me flourish in my professional life. Things have been going great! But changes are on their way, and my mindfulness game is not on point. Wedding planning, moving, money, jobs, oh man, there’s a lot going on. It’s really easy to feel discouraged and overwhelmed, but I’m working at overcoming these feelings because I know that everything will work out. How do I know this? Because life always works out. Especially when you channel your inner Mindfulness Diva. The thing about life is that it is more like a ferris wheel than a climb to the top. We experience hardships so we can appreciate successes. But our idea of success shifts, new challenges arise, and things just change. Then, all of sudden you look around and see that you’re back at the bottom…again. 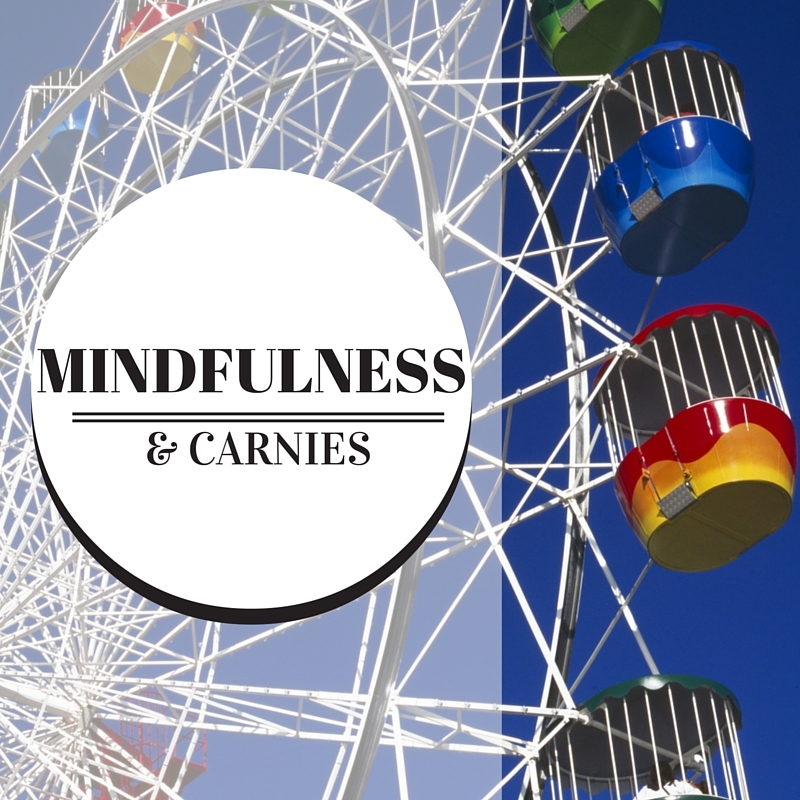 You’ve found yourself at the loading platform of the ferris wheel of life. And there’s that creepy looking carnie, who embodies everything that you’re scared of – namely, failure*. *Ok, ok, that was particularly harsh. I actually always wanted to be part of a travelling circus. I was just trying to make a point that at the bottom, feeling defeated, you’re faced head-on with everything that you didn’t want for yourself and your life. And most people agree that they wouldn’t want to be a carnie. I haven’t done actual studies on that, but I’m pretty sure it’s an accurate assumption. You have two options: 1) get off the ride. Sure, you’re surrounded by everything you hate, but hey – you chose to come to the fair, right? This is synonymous with giving up. Or, 2) you can stay on for another ride. And of course, that beautiful view of circus tents, a setting sun, the Octopus ride off in the distance, that won’t come right away. People still have to get off the ride, and others on. So you move a few feet, hear the clink and squeal of the safety bar opening, and the carnie yells “Next!” Then you move up a little more, inching your way to the top. You know you’re going to get there, you just aren’t sure how long it’s going to take. Ok, you might be thinking I’ve totally lost my marbles. I’m hoping you’ve been able to follow what I’m trying to say, but in case you’re missing the point, here is it: there are ALWAYS going to be ups and downs. Nobody ever gets to stay at the top of the ferris wheel forever. And why would anyone want to? Without going up and coming back down, it’s not a ride, it’s just a really high place to sit. And where does mindfulness come in to all of this? When you’re at the bottom, looking that carnie in the eye, you need to know that you’re are on your way back up to the top. Your quest for your hopes and dreams isn’t over. So what you got dumped? So what you have financial insecurities? So what everyone is telling you that you’re going to be a failure? You’re staying on this ride. And you know what? The only way is up! Cue the song Spinning Wheel by Blood Sweat and Tears. Keep living, my fine people. And enjoy the ride! You’re right. Sometimes you feel like you are the Ferris wheel though. Your life is at completely unbalanced odds. Parts are amazing and parts are the worst. It’s confusing and taking time to breathe and still can help with perspective. I saw a yoga studio today that had a sign that said “move your body to still your mind” and it made me come home and put on a YouTube yoga video. I never realize how much I miss it until I do it again. SO true, Deb! Sometimes we definitely ARE the ferris wheel! Sending you, the world, and myself positive energy to cultivate balance, good health, and the ability to be still amidst the craziness of life.